Golden Corral – Fort Myers, FL, 4690 Colonial Blvd. Golden Corral Restaurant, 2082 E. Florance Blvd. We meet the 2nd and the 4th Wednesdays of November thru March. We are open in anyone who owns a Newmar product, so invite the ones that you meet along the way. All are welcome. We have room for everyone! This year we will again be meeting at the Golden Corral Restaurant and will be meeting in the corner behind the bakery. Yum! RSVP for this Newmar Owner's Breakfast in Mesa, AZ. RSVP for this Newmar Owners & Guests Luncheon. All Newmar owners are invited. You do not need to belong to the Newmar Kountry Klub. Contact hosts for more information. 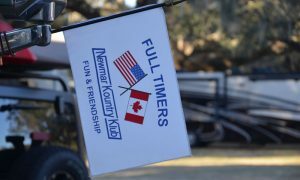 RSVP for this SW Florida Newmar Owners & Friends Luncheon. Golden Corral, Surprise, AZ 11:00 am Registration, meal 11:30 am, program or visiting to follow. Golden Corral, Surprise, AZ 11:00 am registration, meal 11:30 am. Program or visiting to follow. Golden Corral is located East on US 50 past the intersection of US 27 & 50. If you are coming from the South going North on US 27 go past the US 27 & 50 intersection, make a "U" turn and get on US 50 East. Golden Corral will be on the right. Please wear your name badges if you are a NKK member.